The first two questions of each questionnaire served to identify the respondent. Questions three through ten provide the content. Questions 3, 4, and 5 are of particular interest, because they deal most directly with variants on the focal question. Question 3 asks the respondent to attend to his or her own personal religious beliefs. Significant here is that among those who self-identify as Roman Catholic, mainline Protestant, evangelical Protestant, Orthodox Christian, Mormon, Jew, and Buddhist, the vast majority expect no crisis to develop when learning of ETIL. No evidence of widespread anxiety or fear that their religious belief system might be threatened surfaces here. 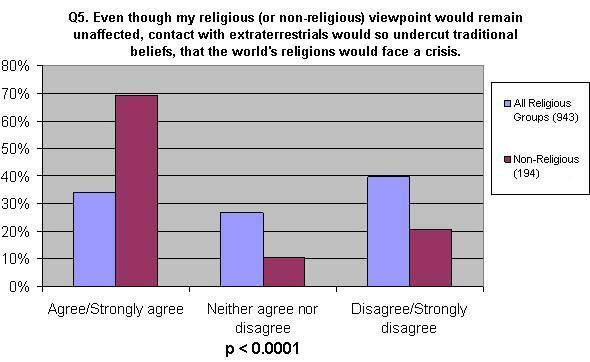 Hey, comments a mainline Protestant respondent, Id share a pew with extraterrestrials any day. If adherents to the worlds religious traditions foresee no threat, then the widespread assumption about an impending crisis fails to gain confirmation here. A stereotype sometimes surfaces: fundamentalist believers are the most vulnerable to a religious crisis because ETI does not fit the fundamentalist worldview. 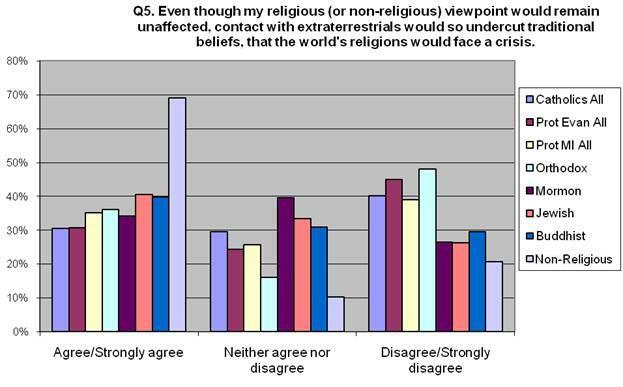 Confirmation of alien intelligence might cause a crisis for Protestant fundamentalism and Islam, for which their scriptures failure to predict the aliens could be quite damaging, writes a non-religious respondent. Within the scope of Christian theology, it appears that little if any beliefs preclude the existence of extraterrestrial beings. Their presence would at most widen the scope of ones understanding of creation and create some puzzles for how Christians understand the work of salvation (Peters, chapter 3). Jews and Buddhists, it appears, would experience even less friction in their belief systems should confirmation of the existence of ETI be established. Responses to Question 4 tell us that very little fear is registered regarding a possible threat to ones inherited belief system. However, the numbers are not identical to those of Question 3. They drop slightly in the Disagree/Strongly disagree option. Might this indicate a slightly higher level of confidence with ones own individual beliefs than with the beliefs of the larger religious tradition to which one belongs? Here is what one Buddhist told us: As a Mahayana Buddhist, with a worldview that includes in scriptures Buddhas and bodhisattvas from many different world systems, such information [news about ETI] would not be shattering theologically, though of course institutions and practices might reverberate. One respondent offered this: the strict followers of religion would be the most affected by such a finding of extraterrestrial life whereas the loose followers such as myself would welcome the new discovery. Might a small number of respondents worry slightly more about others in their tradition than they do about themselves? This interpretation could be supported by data drawn from another survey. A 2007 survey of more than 35,000 Americans conducted by the Pew Forum on Religion and Public Life uncovered a trend that may be indirectly relevant. Whereas conventional wisdom might suggest that the more religiously zealous a person is the more intolerant he or she would be, this survey indicates that the opposite is true. Zealous Americans are tolerant, even welcoming religious perspectives that differ from their own. To the statement, many religions can lead to eternal life, for example, 57 percent of evangelical Protestants agreed as did 79 percent of Roman Catholics. So did the majority of Jews, Hindus, and Buddhists. What this suggests is a broad trend toward tolerance and an ability among many Americans to hold beliefs that might contradict the doctrines of their professed faiths (Banerjee).Now, this survey is limited to Americans and it does not test directly for openness toward ETI. However, if it is in fact the case that many religious people are capable of holding beliefs that might contradict the doctrines of their professed faiths, then it might follow that those who welcome ETI into their worldview could do so even if they worry slightly about doctrinal fragility in their own respective religious tradition. After seeing how firm the Disagree/Strongly disagree position is taken by adherents to the major religious traditions in Questions 3 and 4, the contrast with Question 5 becomes illuminating. A slight majority remain in the Disagree/Strongly disagree category. 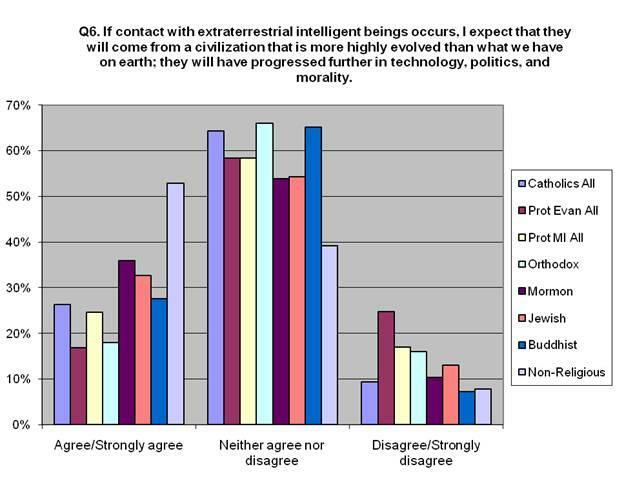 Yet, the Agree/Strongly agree cluster is significantly higher than in Question 3 and still higher than in 4. Those who identify with a major religious tradition give a modest degree of credence to the forecast that the worlds religions - religions other than their own perhaps - might confront a crisis. Some degree of credence only, we stress; yet, it is still worth noting. Could it be the case that an individual religious believer is slightly more worried about someone elses beliefs than his or her own? 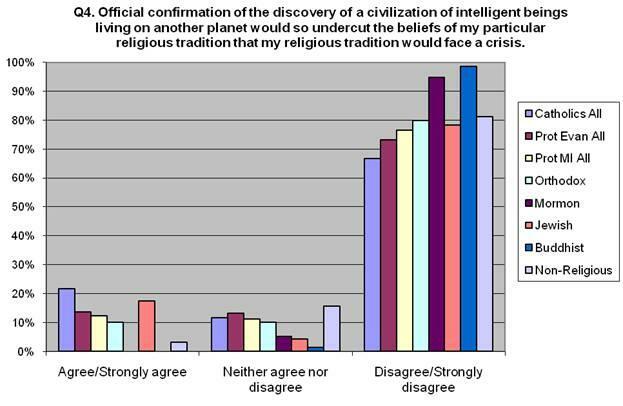 At minimum, respondents were willing to say that some religious traditions are more vulnerable to a crisis than others. A Buddhist projected a crisis for some religions but not others: lumping together all the worlds religions is a conceptual error (as in Question 5). The religions of the book (the Abrahamic traditions) would have a very different set of reactions than the Asian traditions. A Buddhist typically belongs to an Asian tradition; so in this case we seem to see an Asian who is worried about the three Abrahamic (monotheistic?) traditions. A Jehovahs Witness tried to gain precision: I think #5 should say some world religions would be affected, not all. Some respondents saw the crisis precipitated by news of ETI as temporary, leading eventually to a strengthening. I believe in the short-term there will be crises...but in the mid- and long-range, pre-contact belief will return to normal or perhaps slightly strengthened, wrote a mainline Protestant. Now, let us turn to the 205 respondents self-identifying as non-religious. What happens in Question 5 may be quite revealing. We will look again at Question 5, comparing the non-religious with all the religious traditions grouped together. In this chart comparing all those who identify with one or another religious tradition to non-religious respondents, we computed the P value. The P value is much less than 0.0001. This gives us confidence that this comparison is not the result of a mere sampling error. P represents the probability that the two groups are indeed the same, presuming that any apparent difference in a given sample is just the result of random chance. Chance plays a part whenever a sub-sample of a population is taken. Might the difference between religious and non-religious be due merely to a sampling error? We do not think so. The difference between these two groups in our sample would only come about by chance in less than 1 out of 10,000 samples taken from groups were indeed the same. 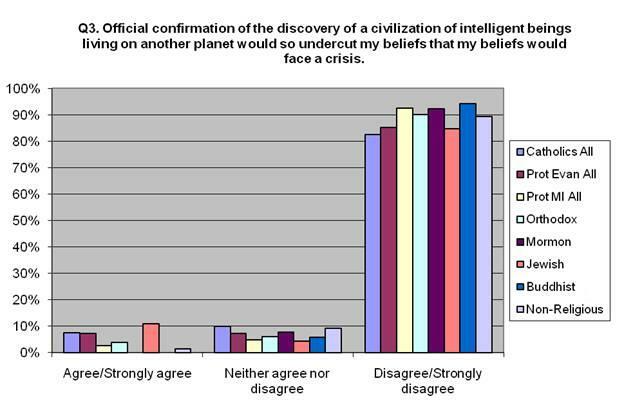 With this confidence, we observe how a significant majority (69%) of those who identify as non-religious project a crisis for religion. This is twice the average of those who are affiliated with a religious group (34%). That is, the non-religious have a much more negative forecast for religion than do adherents to religion. What might this suggest? Could it suggest that non-religious persons think of themselves as more open to ETI than their religious neighbors? Might this observation speak directly to what some astrobiologists assume, namely, that as scientists they are more open minded than their closed minded religious neighbors? One self-identified non-religious respondent warned strongly, our religions, most of which are dogmatic, would be rocked. Another wrote with nuance: encounters with aliens will so frighten the ordinary human that he/she will cling more strongly to their beliefs. From the point of view of the non-religious, religious beliefs are fragile and vulnerable to a crisis. inclined to impute fragility to other religions to which they do not subscribe or about which they know little. Non-religious people seem to know too little about religious people, because they are mistaken in their assessment of the fragility of religious beliefs. Our central finding is this: the hypothesis that the major religious traditions of our world will confront a crisis let alone a collapse is not confirmed by the Peters ETI Religious Crisis Survey. Furthermore, it appears that non-religious persons are much more likely to deem religion fragile and crisis prone that those who hold religious beliefs.